It's almost that time of year again. Fall is quickly creeping onto our back doorstep, and it will soon be time to celebrate Halloween. And there is never a better way to do that than visiting Halloween Horror Nights 2017 at Universal Studios. Especially this year, because they have the ultimate scare planned. The titans of terror are gathering for an experience that will turn your spine to mush, and leave you quacking in your boots like Don Knotts. Yes, for the first time, Freddy Krueger, Jason Voorhees, Leatherface and Chucky will be uniting for two all-new horrifying attractions. And it promises to be one of the greatest things ever unleashed at any Halloween Horror Nights event yet. Universal Studios Hollywood is uniting these four slasher film legends for their "Titans of Terror" experiences. And it all gets a little too real starting Friday, September 15, 2017. The all-new "Titans of Terror" maze promises to be one of Halloween Horror Nights' best yet. Guests who enter the park will be able to come face to face with some of their favorite on-screen killers in an immersive experience that will stop their heart. And all will be showcasing their signature bladed weapons. So you better watch out. You don't want to wind up on the wrong side of this terrible bunch. Leatherface (The Texas Chainsaw Massacre) will be packing his iconic chainsaw, Jason Voorhees (Friday the 13th) will come at you relentlessly with his machete, and Freddy Krueger (A Nightmare on Elm Street) never leaves home without that trademark glove armed with razor blades. Then there's good old Chucky with his stainless steel knife. So easy to clean. And it can go months without sharpening. This new maze promises to be an assault on guests' sensibilities as they descend into the forbidden realms of these iconic horror legends. Speaking of Chucky, he'll be taking terror to unspeakable levels, eliciting bloodcurdling screams from the bravest of individuals. Prepare yourself. You may not be ready for the "Titans of Terror Tram Hosted by Chucky". He will be transporting guests into a nightmare world of gore and carnage, as he pits guests against these modern horror icons. Chucky will come packing a faithful army of degenerate chainsaw-wielding Good Guy Dolls. And havoc will be unmercifully unleashed upon guests as they try to fight their way out of the world-famous Universal Studios backlot. 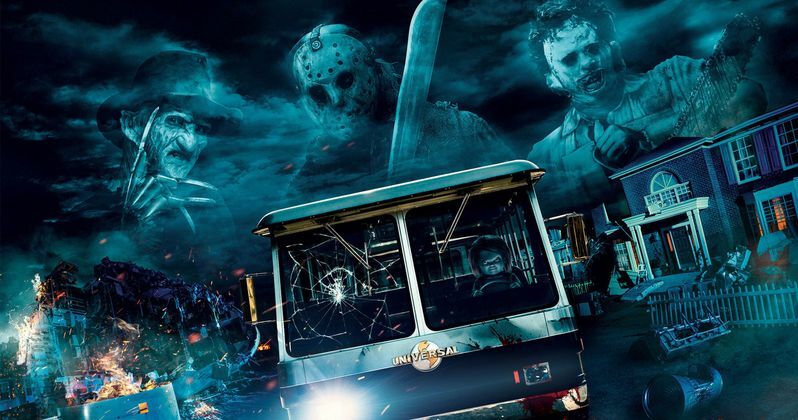 Once you hope aboard the "Terror Tram", you'll find yourself face-to-face with Jason Voorhees (Friday the 13th) at the Crystal Lake Motel, where he likes to gruesomely fillet newly arriving camp counselors. You'll also get to experience a once-in-a-lifetime confrontation with Freddy Krueger (A Nightmare on Elm Street). Freddy's ready to take his ultimate revenge on the town of Springwood. This trip will end with a terrifying visit to the barn from The Texas Chainsaw Massacre, where Leatherface and the Sawyer family are having a little too much fun butchering their victims for a cannibal feast. The Terror Tram has become one of Halloween Horror Night's defining traditions. And its a unique experience unlike anything you'll see at other horror themed parks. The ride allows guests to walk amongst the famed movie and television studio, where such sets as the Psycho House and the Bates Motel from Alfred Hitchcock's classic thriller, and the crashed airliner from Steven Spielberg's War of the Worlds, are located. The official PR states this quite boldly. "Halloween Horror Nights at Universal Studios Hollywood brings together the sickest minds in horror to immerse guests in a living, breathing, three-dimensional world of terror. Featuring an all-new slate of unrivaled film production quality mazes and frightful scare zones, "Halloween Horror Nights" will taunt, terrorize and torment guests with spine-chilling haunted attractions as part of Southern California's most extreme Halloween experience." This year's Halloween Horror Nights promises to be one of the best yet. Updates on the event happening at Universal Studios Hollywood are available online at HalloweenHorrorNights.com/Hollywood. All you square brains out there better beware! Freddy is coming for you, and this year he's bringing Jason, Chucky and Leatherface too. There are going to be some truly great new Halloween Horror Nights mazes to sink your bloody teeth into.